‘Group lots should be viewed’ was the wise recommendation in the catalogue description of this mixed bag offered at Tennants’ (18.5% buyer’s premium) sale of vintage costume, textiles and dolls at Leyburn on May 13. Mixed lot including amber parasol ahndles which sold for £4500 at Tennants. 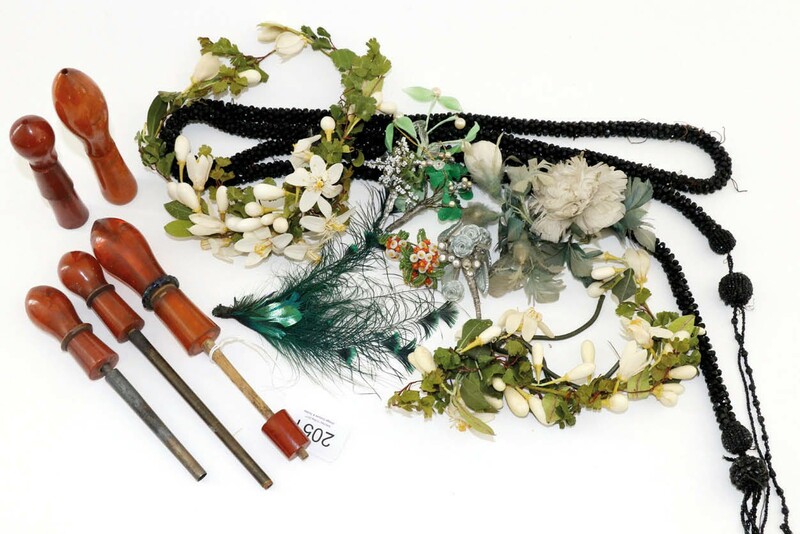 It comprised a French jet soutoir, various wax flower headbands, beaded corsage, feather items and, crucially, five parasol handles made of amber. The auctioneers did highlight the parasol handles as separate illustrations in the online catalogue, but the £50-80 estimate looked remarkably low. Popular in pre-war Europe, untreated natural amber – with its supposed qualities of good fortune and healing in China and its high status in the Gulf region – has been rising in demand and price for the past five years. At Leyburn, the Far Eastern buyer’s £4500 bid for the parasol handles put everything else into the shade.